The Brachman Spring/Summer 2016 collection unveiled at Stage at me Collectors Room on July 7, 2015 in Berlin during Mercedes-Benz Fashion Week Berlin. Architect and fashion designer Jennifer Brachmann, born in 1980, lives and works in Berlin. After a degree in architecture from TU Dresden, she studied fashion design at Burg Giebichenstein University of Art and Design Halle where she graduated in 2010. Her collections are characterized by the contrast between the timeless forms of architecture and the dynamic forms of fashion. After her internship at Veronique Branquinho in Antwerp and completing several freelance fashion design projects, she founded the Label BRACHMANN POST-CLASSICAL MENSWEAR together with her partner Olaf Kranz in 2012. 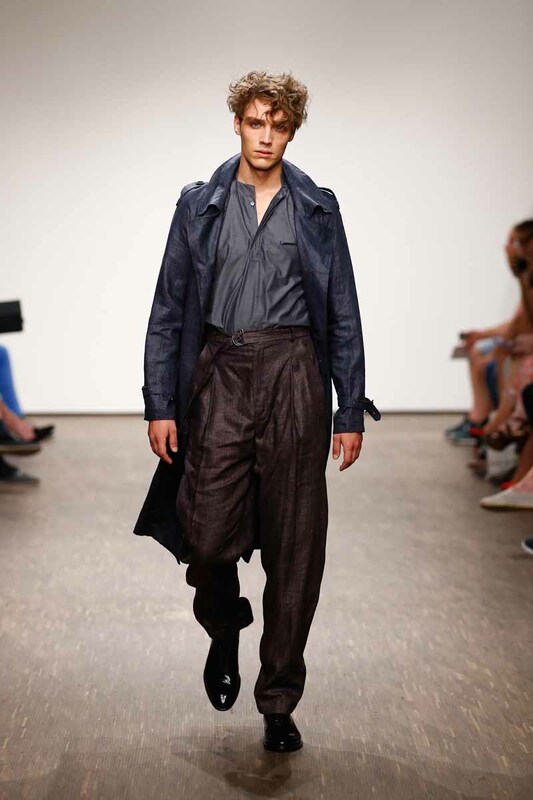 The label BRACHMANN POST-CLASSICAL MENSWEAR modernizes menswear classics by playfully reinterpreting their patterns, shapes and forms by looking for inspiration in classical menswear staples as well as in architecture, popular culture, and modern art. BRACHMANN synthesizes progressive design, perfect fit, exquisite materials of natural fibres, and a luxury finishing made in Germany into a cohesive men’s apparel line of urban chic and minimalistic elegance. BRACHMANN creates post-classical menswear to please the contemporary man who wants to express his individual version of masculine identity with style while respecting the code of the menswear classics. A model poses at the Brachmann show during the Mercedes-Benz Fashion Week Berlin Spring/Summer 2016 at Stage at me Collectors Room on July 7, 2015 in Berlin, Germany.